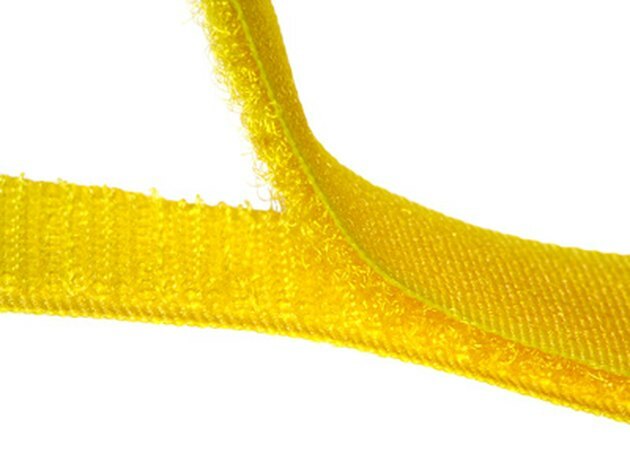 The Velcro company produces hook-and-loop fasteners in a wide variety of sizes and strengths. The fasteners consist of two sides, one has hooks and one has loops. When the two sides are pressed together, they stick to each other. When you pull them apart , it sounds like something is ripping. These fasteners have many uses, including home decorating, gardening and sewing. The name "Velcro" is a trademark, but it is often used to refer to all types of hook-and-loop fasteners. Velcro can be mounted to many surfaces. Many Velcro brand fasteners are available with sticky backs. These can be mounted to walls, shelves, tables or other surfaces. Industrial strength Velcro tape is available for heavy objects. Choose the type of Velcro that you would like to use to mount your object. General Velcro adhesive tape is available for everyday use in several colors, including a clear fastener that blends into surfaces. An industrial strength fastener, the "Ultra-Mate" fastener, which is very thin but very strong, is available as well as an "Extreme" tape for use on rough surfaces, a lightweight tape for posters and a vinyl-friendly adhesive for plastics. Wash down each surface you wish to adhere the Velcro, as it will stick better to a clean surface. Be sure to use a cleaning product that will not leave an oily or filmy residue on the surface. Velcro recommends using alcohol prep pads to clean the surfaces. If you are using Velcro tape that comes in a roll, use a pair of scissors to cut it to a size that fits your object. Peel away the protective backing from the adhesive strip on one of the halves. Firmly place the Velcro onto the surface with the adhesive facing the surface. Press down with your fingers for a few seconds, then let go. One half of the Velcro is now mounted to the surface. Repeat steps 4 and 5 to apply the other half of the Velcro. It may be easier in this step to apply the other half of the Velcro to the half already applied to a surface to make sure it is aligned properly, and then remove the tape and affix it to the surface. If you are using the adhesive Velcro on fabric, it is possible to sew it on if you want make sure it stays attached. Michelle Enos has been freelance writing since 2010. She is especially interested in writing about photography, music, health and environmental issues. Enos is pursuing a Bachelor of Arts in piano performance from the University of New Hampshire.